With its dramatic rock landscape and 1,500 climbing routes, it's plain to see why Smith Rock State Park is one of Travel Oregon's 7 Wonders. And while Smith Rock should not be missed when visiting Central Oregon, there are a lot of great adventures near Smith that are certainly worth exploring while you're in the area. We've put together a few highlights from a loop through the McKenzie and Willamette Pass area. Located just on the other side of Highway 97 from Smith Rock is Steelhead Falls, a short half-mile trail to a favorite local swimming hole. After you've cooled off in the cold waters of the Deschutes River, head out Highway 20 and stretch your legs on a 4-mile Black Butte Trail hike in the Deschutes National Forest or a 7-mile Canyon Creek Meadows loop in the Mount Jefferson Wilderness. 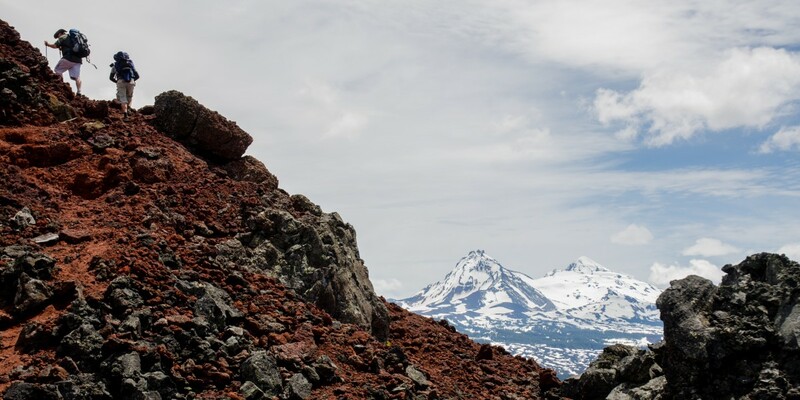 Both trails will reward you with wildflowers and beautiful views of Broken Top, Three Sisters, Mount Washington, and Three Fingered Jack. If you'd like a closer look, the 10-mile, fifth-class mountain climb to the summit of Three Fingered Jack will not disappoint. While you're in the area, it's worth a stop at Skylight Cave to explore the lava tube, one of the many unique remains of volcanic activity in Central Oregon. For more river adventures, head west for some rafting or fishing on the McKenzie River, hike the McKenzie River Trail, and chase waterfalls at Koosah Falls, and Sahalie Falls. The two falls are connected by a 1-mile trail, making visiting both falls in one stop an easy endeavor. Further down the McKenzie River you'll find Bigalow Hot Spring set partially inside a small cave. There is no fee for this hot spring unlike nearby Belknap and Terwilliger Hot Springs. If you're up for more hiking and waterfalls, head east toward Proxy Falls and Little Belknap Crater. Short scramble up to the summit of Little Belknap Crater. Photo by Michael Sawiel. If you're looking to get a little mountain biking in, change gears and go west for a 19-mile ride on Olallie Trail or a 12-mile King Castle to Castle Rock Trail. As you're making your way up these trails, remember that the views and the ride down will make the climb worth it. South of this area on the Willamette Pass there is a plethora of mountain biking trails between Lowell and Oakridge including Salmon Creek Trail, Lost Creek Trail + Sawtooth Trail + Hardesty Trail Loop, Goodman Creek Trail and the scenic North Shore Trail. Lowell is the furthest point from Smith Rock on this itinerary, and it is about 2 hours and 45 minutes away. To round it out, spend a day or two exploring one of the many Adventures at Waldo Lake or Crescent Lake. These lakes are just 2 hours south of Smith Rock.